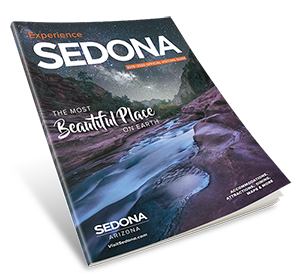 Almost the entire world knows that Sedona, strategically situated at the mouth of spectacular Oak Creek Canyon, is a unique place. 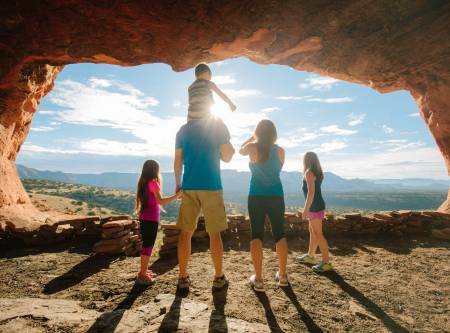 Located in Arizona’s high desert under the towering southwestern rim of the vast Colorado Plateau, the city of Sedona is blessed with four mild seasons marked by abundant sunshine and clean air. Ideally, the annual average high and low temperatures are 74.7 and 45.7 degrees, respectively. 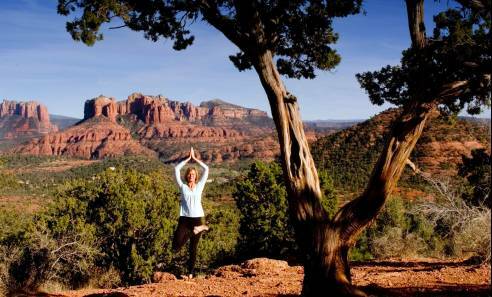 Almost the entire world knows that Sedona, strategically situated at the mouth of spectacular Oak Creek Canyon, is a unique place. 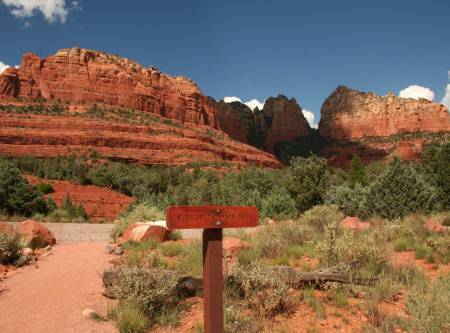 Characterized by massive red-rock formations, as well as the contrasting riparian areas of Oak Creek Canyon, the area surrounding this beloved community is considered at least as beautiful as many national parks. 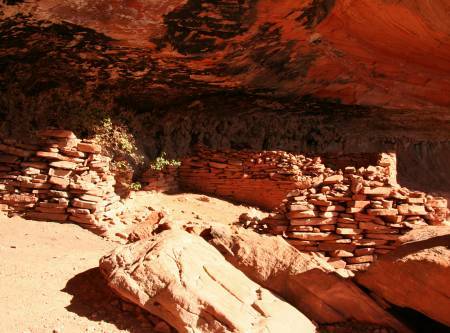 Learn more about why Sedona’s natural beauty goes so much deeper than the stunning rock formations. The story about how Sedona was named is well known; nonetheless, a brief telling is appropriate. As the story goes, after Theodore Carl Schnebly and his wife, Sedona, moved to Sedona from Gorin, Missouri, the few families living here convinced T.C. to establish a post office in his large home, which already had become the community’s hotel. Various interpretations of this story suggest that he asked the government to name the post office Schnebly Station or Red Rock Crossing. Subsequently, he was told the names were too long, and following a suggestion by his brother, Dorsey Ellsworth Schnebly, he submitted his wife’s name, Sedona. And so it was. The city of Sedona, one of Arizona’s premier tourism, recreation, resort, retirement and art centers, was incorporated in 1988. Historically, it was a rural ranching community located far off the beaten path, but its unsurpassed natural beauty became nationally known through the motion picture industry. Today, commercials and television shows still are filmed in the unsettled areas surrounding this city, which annually attracts more than three million tourists from around the world. Curiously, this 19-square-mile city is split between Coconino and Yavapai counties, and only 51 percent of its area is privately owned – the rest is part of the Coconino National Forest. 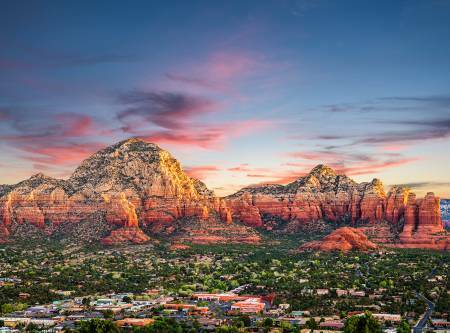 The average age of Sedona’s population, which totals approximately 10,000 within its incorporated limits, is 50 and the elevation generally is considered to be 4,500 feet, though well-known red-rock formations extend to more than a mile-high elevation. Even this city’s airport, high on a mesa, is situated at an elevation of more than 4,800 feet, and when airplanes zoom off the end of the runway, the term airborne takes on new meaning. The 12-year-old Sedona-Oak Creek Joint Unified School District includes Sedona Red Rock High School, an extremely handsome facility at the base of Schuerman Mountain, as well as West Sedona Elementary School. Also, numerous private elementary and college prep schools serve students in this area. Founded in 1995, Sedona Charter School is the oldest charter school in Arizona. Over the years, this school has established a place of honor within the educational reform movement and among families who value excellence in education and now houses 160 students. In this small-school atmosphere, the students reach high levels of academic achievement, scoring well on standardized tests, winning in national and regional language, arts, science, and math competitions, and going on to become leaders and high-performing students in high schools and universities across the country. The Montessori method forms the foundation of the Sedona Charter School curriculum. The high teacher-student ratio, which ranges between 1:10 and 1:15, enables the students to receive ongoing individualized assistance. For more information, visit their website. Yavapai Community College has a campus in Sedona, and Coconino Community College also offers its curriculum to local students. Northern Arizona University is located in nearby Flagstaff, and Arizona State University in Tempe is approximately 100 miles away. Though the fact that parts of Sedona are located in both Coconino and Yavapai counties complicates the matter, it generally is considered that property taxes in this city are fair and reasonable. For example, taxes on residential properties total approximately 1 percent of the selling price. For complete information, consult with the assessor of either county or contact a real estate firm. The Sedona Film Office is your ultimate resource for everything you need to film in Sedona, Arizona.